I've now drilled holes in the front of the n2050's plastic chassis to add circulation. Two rows about 5 holes, each about 3mm diameter. I took off the top plate that says thecus (I'm not one for aesthetics) to make room for the top row of holes. The bottom row is in the white lower section (which is nice and thick and still strong). The fan now seems to be putting out noticeable flow, whereas before it didn't. We'll see whether it seems to help with heat much or not. After a month or more, seems to work pretty well. Here's a pic of the ugly holes. You didn't quite get them straight! and is it trouth... 2 harddisk (500mb) inside will be heatet to 65 degree!!!! I see the point of this modification as I also recognized that the HDDs are getting hot in the case, but would rather blame Thecus for designing a case with insufficient airflow. The small case fan seems to be too weak for cooling two HDDs which are stacked on each other. A more powerful case fan and an additional small fan in front of the HDD cage might work better, but I'll leave it to the enigineers at Thecus to figure out what works better. I've now drilled holes in the front of the n2050's plastic chassis to add circulation. Well, cut a 40mm fan hole on one side of the case and didn't allow for the top cover middle slide lock, so the hole is in the wrong position. For the moment I have taped over the hole, but with a Coolink SWiF 120mm fan on top blowing downwards, the Thecus N2050 is as cool as a cucumber running two Seagate 320GB SATA II drives. Also noticed that one of the internal circuit boards is from the N2100. Have also improved the LED front-panel lighting by placing black plastic LED mounts over them. This has concentrated the light forward and eliminated the sideways glare. Latest to report. Have had two missing Raid Arrays (Raid 1) and tried the USB connection rather than the eSATA. It went missing too a couple of days later. 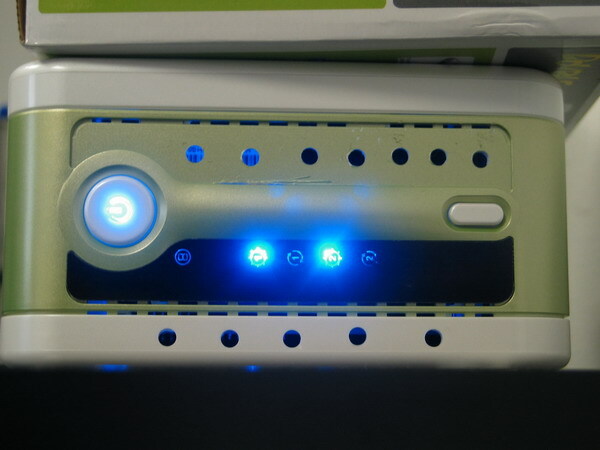 Guess it's either the Thecus box or the eSATA interface card, but the USB connection seems to rule that out.